Refrigerators are key to modern living and convenience in our homes. They keep our food cool, simplify cooking and allow us to enjoy perishable foods whenever we want. When our refrigerators stop working it can have a dramatically negative impact on our daily schedules and meal preparation. If you have an Amana refrigerator and it is exhibiting signs of malfunction, call us right away, before the appliance breaks down completely. 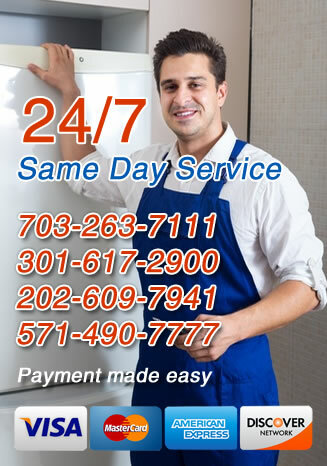 For those living in Virginia, Maryland and the greater Washington D.C. area, the Amana refrigerator repair service you can trust to get the job done fast and right is All Time Services. With years of experience working on Amana refrigerators, we will get your appliance back up and running before you know it. If you have water in the bottom of your refrigerator, it can indicate that your drainage pipe is clogged. To fix this problem, unplug the fridge (after removing all the food) and move it away from the wall. Let the fridge defrost for a day, then plug it back in. If this doesn’t fix the problem and you are still getting puddles in the bottom of your fridge, call an appliance repair professional. If your Amana refrigerator isn’t working properly, there is almost always a good reason, and most of the time a simple repair will solve it. However, that doesn’t mean you should attempt to fix the problem on your own. In fact, while most Amana refrigerator repairs are straightforward for trained experts, these are still highly complex machines with many moving parts, and problems can be made worse if the proper care isn’t given to them. What kinds of problems are we talking about? The most common issues with Amana fridges, or any refrigerator for that matter, are related to the cooling ability of the appliance. It might not cool enough or it might start freezing food in the refrigerator unit and covering your frozen food with a thick layer of frost. Another common problem is leaking. Leaks in refrigerators occur for a number of reasons, including a leaky drip pan, a broken ice maker or a faulty evaporator coil or drain pipe. That’s why it’s so important to call a professional when you suspect a problem – they will know exactly what to look for. New refrigerators aren’t cheap, but if you ignore the problems your current Amana refrigerator is having, you may be stuck paying for an entirely new one sooner than you should have to. That’s why it’s so important to call All Time Services for repairs before minor issues turn into major ones, and your fridge undergoes a breakdown. 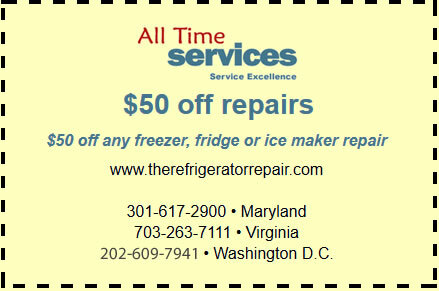 Our technicians have been repairing Amana fridges in Arlington, Virginia, Gaithersburg, Maryland and the washington DC surrounding areas for years and we’re always available for inspections and emergency repairs.